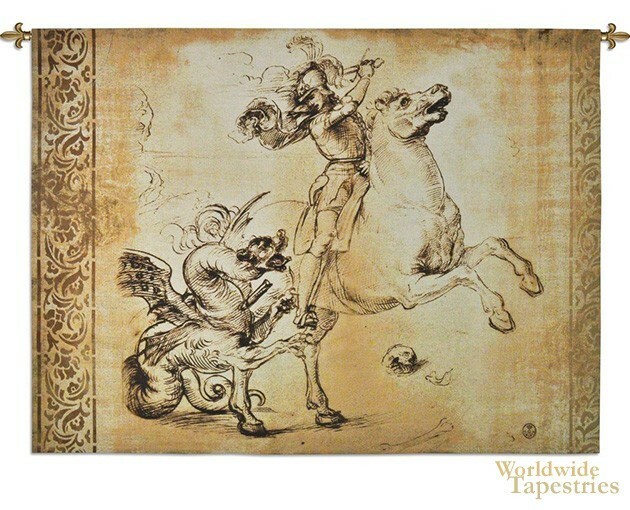 Saint George tapestry shows the famous work of Raphael's St George slaying of the dragon. An Italian Renaissance painter of works depicting art of saints and angels, this piece of Raphael (1483-1520) shows St George upon a horse, and is based on his cabinet painting from 1504-06. According to a legend by Voragine that was a medieval best seller the Saint George and the Dragon battle took place in Silene in Libya, The dragon envenomed the land and the villagers gave sacrifices to the dragon to try to appease him. The king's daughter was chosen at random to be the next sacrifice, and when she was being taken away to the lake, St George happened to ride by. He wielded his sword the Ascalon, upon his horse, and injured the dragon. The dragon followed St George back to the village on a leash. Here we see the dramatic moment of St George with the dragon. Saint George tapestry is lined and has a tunnel for easy hanging. Note: tapestry rod and tassels, where pictured, are not included in the price. Dimensions: W 63" x H 46"